I suppose it was just a matter of time during this “eternal” recession (and the eternal “recovery”) before the free market became a free-for-all that masquerades as commerce. Freedom has a lot of different meanings but within the past year I have come to learn a few new ones. The lyrics by Kris Kristofferson, “Freedom’s just another word for nothing left to lose,” come pretty close to these newest definitions of freedom. America did not invent advertising but it did create a business of it, one that has overtaken all sorts of realms where it does not belong. The domains of truth and advertising do not mix very well. Unlike most products being peddled, truth does not have an expiration date. The buying public nonetheless confuses advertising and honesty a bit too frequently. There is also the knee-jerk reaction to this reality. A simple trip to the butcher counter at a local grocery store displays a portion of the American frenzy to market anything and everything during the Great Recession. 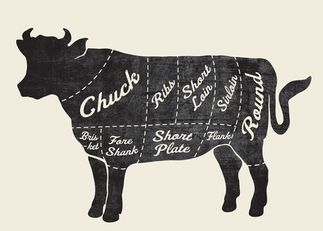 Five ways are listed - in huge letters above the counter - for the customer to feel secure that the ground cow purchased for that night’s dinner lived a happy, blissful, almost carefree life - before it was killed with kindness. Posted above the five compassionate steps involving the butchery of an animal are the even huger letters: R A I S E D. Some creatures are born to run; others are raised to be bludgeoned with benevolence. This marketing is meant to assure the consumer that this little piggy or that plump chicken was not tortured in any way before it was slaughtered. The tale of compassion is certain to cause trauma to any child reading it, but the paying adult customer will feel so much better about eating dinner that night! This retail store can not be accused of the insensitivity of Mr. Blandings, the advertising guy in the film, “Mr. 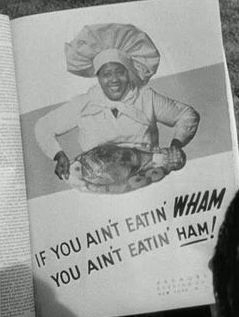 Blandings Builds His Dream House.” As portrayed by Cary Grant, Jim Blandings pulls an all-nighter to meet the deadline for the advertising campaign slogan for Wham, a processed meat akin to ham. Boy (or girl), am I jealous! Do you know how much time I spend on the freeways just trying to buy food? In spite of what anyone might think about Californians and their concern for public transit, their love affair with the car has only deepened since I got here in 1979! As a matter of fact, polygamy is now the norm! But, shhhh! Don’t let anyone know. California has an image to uphold, although I find the cost of holding it up quite taxing. Now the country is such a free-for-all of politically correct mass marketing that still fails to sell the merchandise, we never know what we’re allowed to say, for fear that we will be blamed because the product still doesn’t sell. I personally have kissed brick-and-mortar retailers goodbye in favor of private sellers on-line, some of whom have sued corporate entities for stealing their designs! It’s a free-for-all free market when the Big Guy is stealing jewelry patterns and pottery motifs and accessory ideas from the humble, lowly artisan. I hate to sound like a Marxist but the little artist is getting ripped off big-time by the big-money people! You make a quality item; you charge a fair price for it. You see if the customer buys it. The most recent packaging rage this “holiday season” (which began this year in the US before our Labor Day) is — plaid! Just slap some tartan plaid on the item and it’ll sell. 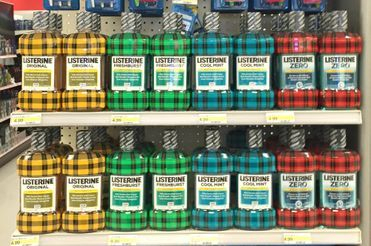 I don’t know about you, but I prefer to see the 6 varieties of Listerine (and I use the original, medicinal brown kind) without a coat of bright plaid on the bottle. Regarding corporate retailers, I’ve given up on ever finding sweat pants that are made of 100% cotton. Actually, I’ve given up on finding sweat pants. Evidently, they are not sold anymore. And I’ve given up on finding a pair of pants where the length of each leg is equal and the zipper is sewn in straight; and dresses with sleeves that accommodate arms, not toothpicks; and tops that extend beyond the navel. The “crop” tee-shirt announced the dearth of fabric and good taste. I’ve also given up on certain retailers ever being the quality stores they were a decade ago. I have found seamstresses, knitters, jewelry craftsman, and artisans in Lithuania, Latvia, the Ukraine, Poland, Greece, the Czech Republic, the United Kingdom, Iceland, and even Russia! I’ve always been a risk-taker when it comes to purchases of merchandise. I ventured into catalog shopping long before it was the norm (all it took was one stomach-turning turn of my toddler daughter playing hide-and-seek underneath the circular clothing rack of a major department store). And I explored online shopping when it was still dangerous. I suppose the danger somewhat appealed to me, but 10 years ago I saw that online shopping was the wave of the future. The brick-and-mortars did not perceive the same eventuality, the obvious inevitability. And it’s their job to do precisely that work - to forecast future buying trends, and anticipate the market to which they will sell. Instead, those “professionals” reacted much like the factory workers in the 1800s when manual labor was confronted with machines and assembly line work: resistance, unionization, protectionism, political lobbying for more protectionism, strikes, and the refusal to integrate the new processes of business into the job of doing business. By the time that the Great Recession began, many brick-and-mortars had not even integrated online shopping into their inventory. Too late, they started to stock online exclusives. Too late, they realized that any customer will look elsewhere (online) for comparable - or even superior - goods. More than a world economy on life-support is the problem here. The problem is the free market was hi-jacked by “the experts” - the charlatans who think they can advertise their way to fortune through the peddling of inferior goods to consumers who are working too much to earn a living and do not have the time (or the energy or the motive) to scout out quality merchandise. Shopping for a pair of boots - leather boots that I slip my foot into, not shoe-horn my little piggies into as I practice calming breaths - this activity ought not be tantamount to a search for the Holy Grail of leather footwear! My little piggies deserve every bit as much compassion as the little piggies that went to market! And speaking of compassion, the “Caring” Fascists — those emotional blackmailers and financial extortionists — are at it again, plying their non-profits in the name of “the children” for their tax schemes. That masquerade never ends! Quite recently, a young, twenty-something female, perhaps a former “Occupier,” waved a paper in my face as I entered the compassionate grocery store. She gaily informed me that 5% of my purchase goes to her non-profit to feed the children in Sacramento schools. “Do you care?” She shoved the paper at me. I found this female and her ploy for my money obscene. Evidently so did the other customers. They did not give her the time of day. I gave her a minute piece of my mind which was the only donation she deserved and, even then, it was not adequately valued or assessed. “Free speech” is sometimes a poor bargain. In reality, there is no “free speech,” “free lunch,” “free market,” “free love” or even “freedom.” There’s a price for everything on this earth that each mortal must, sooner or later, pay. It is true that some people deem themselves divine and above the laws of mortals or of God; they pay the highest price of all. Man cannot play God and get away with it. That charade, playing the Highest Power, is the free market masquerade that socialists play in capitalist countries. These hustlers of altruism attempt to be all for commerce but, in reality, they abhor the free market. They abhor freedom. Remember the kids on the playground who would not share? They grew up to be socialists. Marxist tigers don’t change their stripes; they just get gray and white. You never know who you are going to meet in the park. One afternoon outing with my little tykes about 20 years ago turned that romp in the park into an economics lesson, although I was both the giver and receiver of the knowledge. A young mother was there with her little tyke. We got to talking and she commented that she’d just arrived in this country from Sweden. I asked her how she liked America. I did not attack her delusion. The reaction I receive is rarely nice. Thus, I did not mention to this mother that the National Socialist German Workers’ Party had the same fantasy about Germany in 1933. Their uniforms were hardly masquerade outfits. My socialist encounter in the park took place in the early 1990s. By that time, the Soviet Union had fallen and Communism mutated into radical environmentalism. That thought disorder has been likened to a constantly changing and mutating virus; I think we all need a massive flu shot. The name of the -ism changes; the end game is always the same: elimination of private property; control of commerce for their agenda; and, in the name of the children; or your health; or clean air, clean water, clean food, clean garbage — concentration of liberty into the hands of the few, The Elites, who govern fecklessly while they dictate (through “control boards” and regulations) the choices in life for the Majority. The Majority is privately known among the Elites as suckers or dolts or the voting public: the moron masses who are too stupid to know when they are getting fleeced by their Government when it shoves Affordable Anything down their idiotic throats. Call me a plucky optimist or a romantic dreamer but I believe that people, on the whole, be they the American citizenry or the French mob or the Russian horde, are not stupid. If people are told the truth, the hard-core truth, not a sugar-spun deception, be it through advertising or campaigns of various sorts for the inevitable purpose of a power grab, then most people will make the right choice for the right reason. Making the right choice for the wrong reason is, in my experienced opinion, worse than making the wrong choice for the right reason. These statements fly in the face of contemporary political punditry. They also fly in the face of the great Victor Hugo who, in Notre Dame de Paris, declares with acerbic disgust: le temps est aveugle, l’homme est stupide. Time is blind, man is stupid. Here, in California, one single proposition, Prop 65, single-handedly did in many family-owned businesses. Warning labels on china are not conducive to sales. It is getting to the point where a potential customer cannot even see the product for all of the warning labels on it. It’s a wonder that anyone knows what’s even inside the box or package or bottle because the exterior is plastered with Nutrition Facts, plus the Ingredients, and this week’s garish promotional merchandising tie-in (Star Wars, Marvel, Disney — which are all Disney). And then there is the Nanny State Stupidity on Display: I am well aware that a Coke Zero has no nutritional value. I take it that adolescents not only know that fact; they now swill the stuff because of it. The Nanny State and its rival for advertising space, the Lawyer Class — are like lawn mowers clear-cutting decency and common sense. These professional meddlers have produced vast swaths of reactionary Libertarians as a result of their oppressive inane need (dare I say, compulsion?) to control the behaviors of every little and big creature on the planet, on Earth, and in Their World. Miraculously, life would go on just fine without these bureaucratic busy-bodies of other people’s bodies and lives! If they can do without you, ducky, so can I. Product images would do just ducky without those fuss-budgets of every budget. The picture of any product for sale “to enhance texture” is done expressly to meet the insatiable demands of two parasitic professions, the politician and the lawyer. I’ll leave the advertisers out of the mix here; there is at least some creativity involved in pitching products to an increasingly depressed public. About ten years ago, I tried to buy a pitcher over the phone from a mail-order company in Ireland. The lass told me that she could not ship the item to me in California because of That Law. I told her that I did not vote for that proposition to outlaw sickness and death. It did not matter. I still could not buy the pitcher because of the dreaded lead content. We discussed my having it shipped to Reno and my driving to pick it up at a P.O. Box, but I refused to go through hoops to buy a $30 item. I refuse to go through any hoops to buy any item! The next time you hear anyone say, “I lost my funding,” the next rip-off act is underway. But way back then, in 1986, the socialists, masquerading as caring and concerned environmentalists, were on the march — as the Soviet Union was collapsing. They mobilized quickly in California to doom commerce through regulations that sound touchy-feely-it’s-for-your-own-good but they are really slow forms of smothering and strangling various targeted industries. More recent decrees and fiats by governments — around the globe — show how the Compassion Class of Former Communists has lost any purported patience: Banning plastic bags (or even bags) more or less wipes out an entire industry. I like owls and other fine feathered friends just as much as anyone else, perhaps even more, but when families are forced onto the dole or forced to move to another state — or to another country — because the head of the household has lost his job over a spotted owl that did just fine nesting in a Walmart sign, then there is something foul going on in the free market system. Frankly, the always fear-driven, precarious fate of the flicker-fish-fly-swatter (not a real bird but it sounds real enough!) — is not a legitimate concern when farms and families are going bone-dry, broke, and bankrupt. The environmentalists are con artists, masquerading as caring, concerned people. In truth, they do not like people, individually or as a group. They are all about the green, as in envy and hard-earned cash, the hard-earned cash of other people. These free-market masqueraders have billions of dollars of blood money in their hands and on their hands, although it is nearly impossible to prove a negative, to add up all of the intangibles that have been looted in the name of saving the Earth or healing the Oceans (which had “only 10 years left” in 1990) or doing it for The Children or rescuing a species that will outlive us all. The species in real trouble is Homo sapiens, the only surviving species of the genus Homo. The free market in America was once free. It has now become a masquerade while socialism tries to ape capitalism. Vital, productive, profitable industries are now forced through “masked” costs to subsidize the slacker pretender “industries”; the consumer pays through the nose for food, energy, water, transportation, clothes, and any other bare necessities of life. Commerce is chaotic and the customer — or consumer — is left out of the transaction. The deal is no longer even real! Regulations and codes and tariffs and laws and fees and subsidies and surcharges; in short, taxes - are not the fix or the restraining rein on how to make money through selling goods or even services. Common sense, honesty, and that little thing called decency are the ways to fix the free-for-all market. There’s nothing left to lose if those steps aren’t taken. The sales pitch that masquerades as “choice” is not what I call liberty; it’s a hammer-and-sickle. As for the free-market frauds, they’re lost in their masquerade.